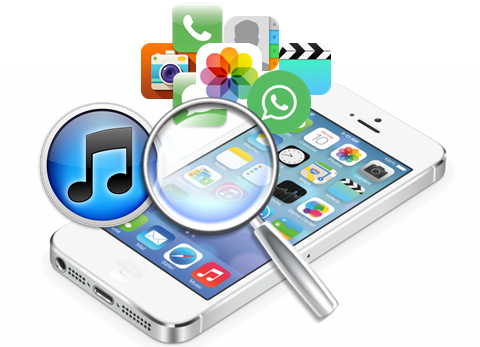 Why Need an iPhone Backup Viewer Tool? To prevent the accidental loss of your iPhone data, when your iPhone is connected to iTunes on your computer, a backup of the phone’s content including your messages, contacts, call history, photos, videos, notes, and other data is automatically generated. Sometimes, you may want to view iPhone backup files on your computer to make sure whether your files or data have been restored. However, iTunes backup is a kind of SQLITEDB file, which doesn’t allow anyone to access or preview. Don’t get disappointed. That’s what an iPhone Backup Viewer tool contributes to. If you want to access and view contents of an iPhone backup that was created by iTunes, Free iPhone Backup Viewer is strongly recommended. It is a simple-to-use and completely free application which can help you go through the backup data stored on your computer, without having to restore it to your iPhone. 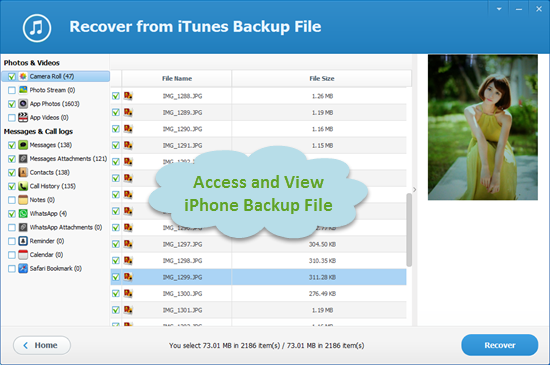 Only several simple clicks, you can access and view iPhone backup content in detail. 1.Run this iTunes Backup Viewer on your computer, then you can see all your iTunes backup files existing on the computer. 2.Choose the iTunes backup file you want to access and click the “Next” button to proceed. 3.Select the file types you want to view and extract, then click “Next” to scan data in the backup file. 4.After scan, you can view contents like photos, videos, contacts, messages, call logs, notes, WhatsApp, and so forth. 5.Choose the items you want and save them on your computer by clicking on the “Recover” button. Where are iPhone backup files stored on Windows computer? Have questions that aren’t addressed here? Please feel free to contacts us via support@jihosoft.com for support. We will try our best to solve your problem within 24 business hours.